More than any other issue in modern Jewish-Christian relations, the state of Israel has provoked intense disagreements. These reflect not just political differences but often profoundly different theologies of the land of Israel and the biblical promises. Dr. Gregerman will explore, from a Jewish perspective, the tensions between contemporary Christians’ broadly positive reappraisals of Judaism and more controversial Christian views of the state of Israel and biblical texts on land and covenant. 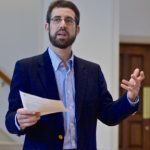 Dr. Adam Gregerman is Assistant Professor in the Department of Theology and Religious Studies and Assistant Director of the Institute for Jewish-Catholic Relations at Saint Joseph’s University in Philadelphia, Pennsylvania. He studies the complex relationship between Judaism and Christianity, focusing on biblical interpretation and religious polemics, especially about theologies of the land of Israel and experiences of suffering and loss. His articles have appeared in journals such as Interpretation, Cross Currents, Journal of Ecumenical Studies, and Studies in Christian-Jewish Relations and in numerous edited volumes. He is a member of the Committee on Ethics, Religion, and the Holocaust at the United States Holocaust Memorial Museum and has received fellowships for the study of interreligious relations from the Hebrew University, the American Academy of Religion / Henry Luce Foundation, and Cross Currents / Association for Religion and Intellectual Life.